Have you ever felt left out or abandoned or been left out or abandoned in reality? Here are some Bible verses that I hope will make you feel better. Hebrews 13:5 appears to be a quote of Deuteronomy 31:8 which says “It is the LORD who goes before you. He will be with you; he will not leave you or forsake you. Do not fear or be dismayed.” This was God Himself speaking to Joshua who was to succeed Moses. Can you imagine anything more comforting than God telling you in person that He will never forsake you or leave you so you have no need to fear or be dismayed? Today God still speaks to us but it is through His Word. In the last letter that Paul ever wrote, “At my first defense no one came to stand by me, but all deserted me. May it not be charged against them! But the Lord stood by me and strengthened me” (2 Tim 4:16-17a). How heartbreaking! Everyone had abandoned Paul and had deserted him, perhaps due to a fear of ending up with the same fate as Paul but God never did as he said “the Lord stood by me and strengthened me.” Today God is standing by us and will strengthen us when we feel abandoned and left out. The disciples were very anxious about Jesus leaving because He had been with them every step of the way for the last three years and now He was about to go and they were not sure why He was leaving them or where He was going. Have you ever felt that God has abandoned you? Do you feel left out of things in life? When I was young, I was frequently left out of the neighborhood ball games because I was small and very clumsy. I would have been the last that anyone would have ever wanted and even in school, I was nearly always the last one picked for sides in sporting activities. 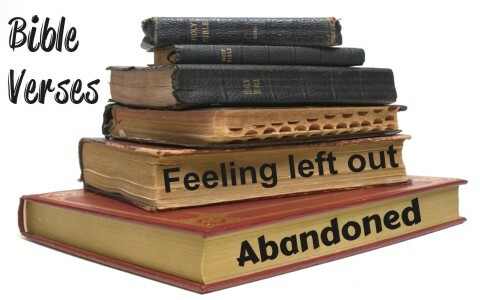 Jesus knows what it feels like to be abandoned as He cried out “My God, My God, why have You forsaken Me” (Matt 27:46)? All had forsaken Jesus at the cross so when you feel abandoned or left out, think of Jesus on the cross. When you feel abandoned, think about God’s Word and His promise that He will never leave you or forsake you, even when we forsake Him. He is faithful to the end, even when we are not. This was written to Israel but it can have application to the child of God. The word for “dwell” is “to tabernacle with” and here God tells the children of Israel the same thing I believe He tells His own children today; He will walk among us, He will be our God, we will be His people, and He will make His dwelling with us or tabernacle with us. The Apostle John wrote “ And the Word became flesh and dwelt among us, and we have seen his glory, glory as of the only Son from the Father, full of grace and truth” (John 1:14) and the same word used for “dwelt” is “tabernacle” so since we know Jesus is the Word, He promised to tabernacle or dwell with us. This is the same phrase Jesus used when speaking with His disciples that if we abide in Him, He will abide with us (John 15:4). The word “abide” is from the Greek word “menō” and means “to remain in, to abide with” so Jesus Himself says that He will abide with us or dwell with us and this is an abiding that is everlasting. The disciples were very sorrowful that Jesus was telling them that He was going to leave them saying “A little while, and you will see me no longer; and again a little while, and you will see me” (John 16:16) acknowledging that “A little while, and you will see me no longer; and again a little while, and you will see me” (John 16:20). Jesus never tried to hide the fact that He was going to leave them and that they would be sorrowful because they wouldn’t see Him for a time but promised “you will see me” again. Then, their hearts would rejoice and the joy they received was a joy that “no one will take” from them. That is a promise to us too since Jesus is now not seen but He’s going to come back for us and we will most certainly see Him and our joy will be for time without end. Think about what these two verses are saying; Paul is sure that death, life, angels, rulers, things to come, powers, height, depth, no not anything in all of creation will be able to separate us from God’s love in Jesus Christ. If we die, we are with the Lord, in life we can rest assured He is with us, no fallen angels, no evil rulers, nothing that’s ahead, no powers, and to cover it all, no created thing at all can ever separate us from the love of God. Here is God’s sure and certain promise that we’ll never be separated from God and anything that God promises is as sure as if it already exists because God cannot lie (Titus 1:2; Num 23:19). If you feel that God’s abandoned you or you feel left out, the first problem I see with this is “feelings.” Human feelings are the most unreliable, undependable things of all but God’s promise is certain. Will you trust your feelings over God’s Word? Feelings are not comparable to God’s promises because He says “For all the promises of God find their Yes in him. That is why it is through him that we utter our Amen to God for his glory” (2 Cor 1:20). I am deeply saddened by the things I see in our world. The color of their skin is stupid That’s what I said STUPID! But yourself, stop the HATE open your heart’s and LOVE. GRACE, and I love you unconditionally want you love me too ?